A woman’s guide to auto repair. There are millions of women who worry about car repairs, due to the fear of being cheated and over charged. Let’s be truthful. Mechanics have been known to take advantage of women and hoping they are not savvy when it comes to car repair. However, a woman’s guide to car repair may be the answer. Patrice Banks recognized that women were being discriminated against by auto mechanics and decided to do something about it. Thus she created a woman’s guide to auto repair. 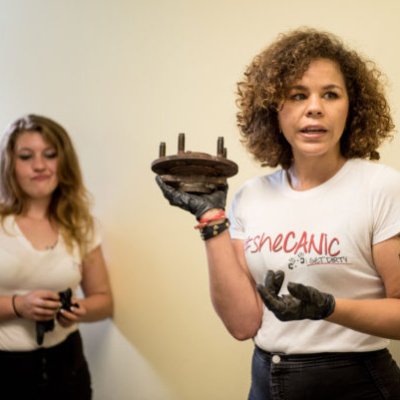 After deciding to enroll in auto repair classes she fell in love with fixing cars and went on to found the Girls Auto Clinic (GAC). She is also the author “The Girl’s Auto Clinic Glove Box Guide”. Patrice Banks teaches about various auto parts to a group at the Haddington Branch Library in Philadelphia, Pennsylvania. Patrice created a business that would serve women by offering her knowledge and resources aimed at women. Banks, a former engineer turned auto mechanic says she was simply tired of being an “auto airhead” so she decided to quit a well paying job as a DuPont engineer to become a mechanic. After a couple of years of studying her new trade Banks earned her diploma. Once she was certified she found it difficult to find employment with a number of businesses as a mechanic, but she was consistent and did not give up. She then went on to start Girls Auto Clinic in Philadelphia. In addition to the workshops there is also the Girls Auto Clinic Repair Center. Ms. Banks has made a name for herself across the country. She has held workshops for women teaching about auto repair and she has spoken before countless groups and on television. Banks has shared her business with a number of platforms. She holds workshops, talks on TEDx, national local tv shows such as CBS This Morning and The FABLife. Her story has also been shared in print. If you’re in the area workshops are held on a monthly basis every 2nd Saturday of the month from 10 am – 12 pm. To learn more about the The Girl’s Auto Clinic Glove Box Guide” and the Girls Auto Clinic Workshops visit the website at Girls Auto Clinic. Be prepared to take notes.